The 2014 Albright Institute Wintersession Program begins on January 6, 2014, and runs through January 24, 2014. 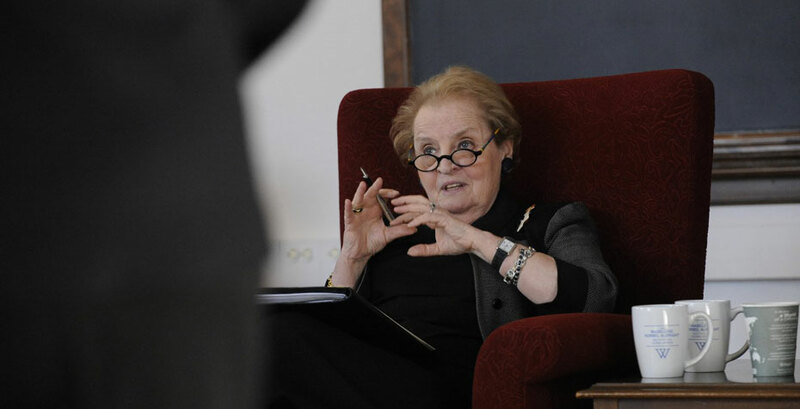 Later this month, former U.S. Secretary of State Madeleine Korbel Albright will return to her alma mater to meet with the 40 promising Wellesley students selected as this year’s Albright Fellows. These young women will spend their winter break in collaborative, cross-discipinary work addressing world problems. They'll work directly with an all-star faculty roster of influential leaders, academics, policymakers, business executives, and journalists. "We are witnessing a generational change in the American political scene," said Madeleine Korbel Albright, a member of the Wellesley College class of 1959, at the launch of the first Institute in 2010. "This is the right time—and Wellesley is the right place—to help train a whole new group of young women leaders." Drawing from what they learn during expert presentations and from their own multidisciplinary studies at Wellesley, the Fellows team up in groups to develop and propose innovative solutions to world problems. They will present their work to the Institute’s Distinguished Visiting Professor for critique and analysis in the final week of the Institute. The 2014 distinguished visiting professor is Carol Browner, former director of the White House Office of Energy and Climate Change Policy and former Environmental Protection Agency Administrator. Albright and Browner, who served together in the Clinton administration, will give a free, public lecture discussing “The Politics of Climate Change” on Wednesday, January 22, at 4 p.m. The 2014 Albright Fellows class comprises 21 juniors and 19 seniors. These students represent 27 different majors at the College and represent 13 countries. The Fellows include 29 U.S. citizens (including three with dual citizenship) and 11 international students. Overall, 13 countries are represented: Canada, China, Ethiopia, France, Georgia, Germany, Hong Kong, India, Philippines, Saudi Arabia, South Africa, United Kingdom, and United States.